Everyone including Income Tax department wanted to get rid of the second step due to multiple reasons, the prime one being tax payers missing out the sending part! Multiple modes were being talked about and finally this year it has materialized. This year onward, taxpayers who e-file the returns need not send ITR-V by post but are required to electronically verify the returns using an EVC (Electronic Verification Code). There is also an additional field to add Aadhaar number in the IT Return forms this year. This however does not link PAN and Aadhaar. I had to use this mode of e-Filing since the Aadhaar linking failed. The process is simple and straight forward. You need to login to internet banking platform of your bank (list of supported banks) and click the e-Filing link there which takes you to IT Department's e-Filing website. 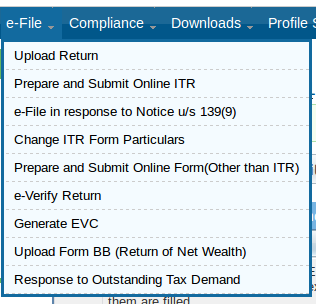 Select the appropriate form to e-file, ITR-1 and 4S are available online. For other forms you will have to use either Java or Excel utility which can be downloaded from the website. After you complete filling all the details based on your Form-16, hit submit. Since you would be logged in through internet banking, on clicking e-Verify, the return gets verified and an acknowledgement is displayed. This is also sent to registered email ID. If you file your returns through a third party service provider or have filed before the EVC process was notified you can generate an EVC to verify the return.